Ever had an awful, sinking feeling, that you’re just not good enough? That everyone else is doing this writing gig, so much better than you? Best-selling story ideas, publishing deals, book releases, fancy awards, more publishing deals, book relea … you get the picture. Everywhere you turn, there’s someone awesome. Doing their awesome thing of being, well… awesome. Social media is a great tool for self-deprecation. If you’re looking for a way to slam that last nail in your ‘I’m not good enough’ coffin, jump online. It will hand you the hammer. Why do we do this to ourselves? Why do we climb on the negativity wagon, just because we’ve read of another creative’s accomplishment or a generic article telling us how we’re doing it wrong? Is it jealousy? Perhaps. Is it doubt? Possibly. But I think the most ‘self-destructive’ messages come from a little voice within, just yearning to be heard. Fear. And that little voice is a nagging drag. I’m fearful of SO many things. Losing loved ones, leaving loved ones, ill-health, uncertainty, but one of my biggest fears, and one that makes me angry with myself each time I feel it, is failure. And, more importantly, fear that others think I’ve failed. Ridiculous, isn’t it?! A school teacher once told me, ‘It’s none of my business what others think of me.’ I thought the teacher was insane for saying it (not that she ‘should have’ cared, it was none of her business what I thought of her). At the time, I couldn’t get past the ‘what others think of me’. I was fixated on others’ opinions about my every move. What if they don’t like what I say or do or think or create? I was so busy worrying about them, I neglected the one person who really mattered most to me. Me. And now, here I am, doing it all over again. Fearing the opinions of others. Comparing myself and my ‘failures’ to others, seemingly endless success. So much wasted energy! You know what?! I’m done. Done with fear. I’ve spent the better half of my life living with it, now it’s time to lay it to rest. I don’t expect this to be an easy journey, but I’m tired of the alternative. Tired of enduring the F word. I know deep down I’m one of the awesome ones… we all are! 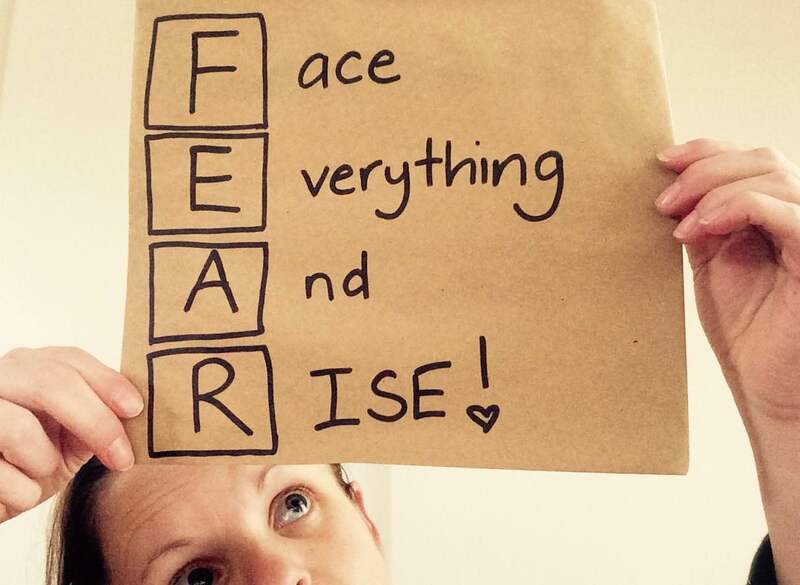 It’s time to kick fear to the curb and let courage step in. Celebrate our steps forward, small and large. Accept our setbacks and use them to better ourselves and our creative goals. Enjoy individuality and varied ideas. Thanks Renee this resonated with me SO much. Every day I wrestle with those insecurities and FEARS. You’re not alone! But yep, it took me a while – now I’m free.